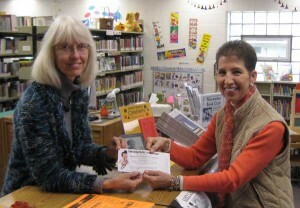 Ardena Roberts purchased the first ticket for the Big Boy spaghetti fundraiser to benefit the Cedar Springs Library on Nov. 10. It’s not too late get one for yourself and not only get a great meal, but a chance to win some great prizes. An anonymous donor has offered the Cedar Springs Public Library the opportunity to obtain a $50,000 matching grant to help move forward the plans to build a new library. The library and the city has until the end of 2012 to raise the money. The announcement was made at a town hall meeting at the Middle School Tuesday evening, with about 50 people in attendance from many of the organizations in town. The library currently has about $441,000 in its library fund, and City Manager Christine Burns estimated that about $2 million is needed. Burns said that before she came to Cedar Springs five years ago, the plans called for $2.2 million. But she expects that as they reach the $2 million mark, the design will need to be tweaked to fit the community’s needs today. Library Director Donna Clark is tickled pink at the news. While some major and small donations have been made over the years, there has never been a real sustained drive. “The ball hasn’t been rolling for awhile now,” she said. The city and library are looking for fundraising ideas to get things going. A used formal dress sale has been set for January 7, with the hope that some of the dresses will be purchased just in time for Valentine’s Swirl. Dresses for the sale may be dropped off anytime at City Hall. Anyone who would like to make a donation to the building fund may send a check to Cedar Springs City Hall, and annotate for the library building fund.